Win a trip for four to The Bahamas and a professional photo shoot so you’ll remember your vacation forever. All you need to do is upload your favorite photo and caption based on the theme of the week. 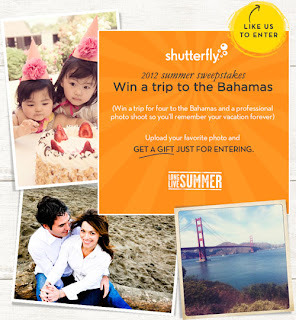 Get a gift from Shutterfly just for entering! You can enter at any point during the 5-week sweepstakes period. • Instant win prizes just for submitting a photo! • Weekly featured photos: up to 5 weekly entries will be selected from the gallery and featured on the Facebook fan page and awarded a $500 gift card on Shutterfly and a copy of the new Lonely Planet travel photography book.